The Geography of North America 2 Edition North America’s physical, economic, and cultural environments are changing rapidly – from climate change and environmental hazards, to the ongoing global economic turmoil, to an expanding population, to the cultural phenomenon of online social networks like Facebook. 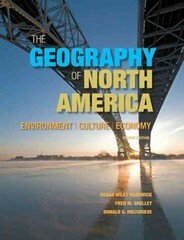 T he Geography of North America: Environment, Culture, Economy is an engaging approach to the geography of the U.S., Canada, and Greenland. While the material is structured around traditional concepts and themes, compelling modern examples illustrate key concepts, including popular culture, sports, music, and travel. The authors’ accessible approach promotes understanding of various regions of the continent as well as Hawai'i and Greenland. The Second Edition strengthens the text’s three core themes of environment, culture, and economy with new data and updated chapter sections, revised feature box essays, and a new pedagogical structure consisting of learning outcomes, checkpoints, and discussion questions. Online media and quiz support are found on the book’s premium website at www.mygeoscienceplace.com.